After an exciting season, the Yankees' chase for 28 campaign has come to an end. The Astros defeated the New York Yankees in a shut-out game 7. Rumors now swirl about the return of Joe Girardi, Brian Cashman and CC Sabathia whose contracts are up at the end of the year. The Yankees were the the underdogs in the series and the favorites to win and eventually face the Los Angeles Dodgers in the World Series. However, the fairy tale season did not turn out the way the Yankees and their fans anticipated. Astros pitching held back the Yankee offensive, including the modern "Sultan of Swat," Aaron Judge. The Yankees could just not hit against the pitching staff of the Astros. The Astros found a way to hit Sebathia's pitches and scored runs and eventually added more via home runs. During their celebration, Astros' pitcher, McCullers mocked the Yankees "thumbs-down" celebratory gesture. Yankees third baseman, Todd Frazier popularized the gesture after witnessing a Mets fan at Citifield give a thumbs down after he homered. The Yankees played there against Tampa Bay due to the passing of hurricane Maria in Florida, the hometown of the Tampa Bay Rays. Yankees manager Joe Girardi claimed that CC Sabathia and a few other players were under the weather and this may have affecte dtheir play. 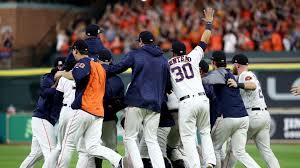 The Houston Astros are now getting ready to face the Los Angeles Dodgers at the World Series. Yankees Manager Joe Girardi, General Manager Brian Cashman and CC Sabathia are now left to wonder if they will be in the Yankees organization for next year. There is no word yet if the Yankees' front office will renew their contracts.